This article provides invaluable advice to all homeschoolers and stay-at-home mums/dads of 2.5- to 6-year-olds. 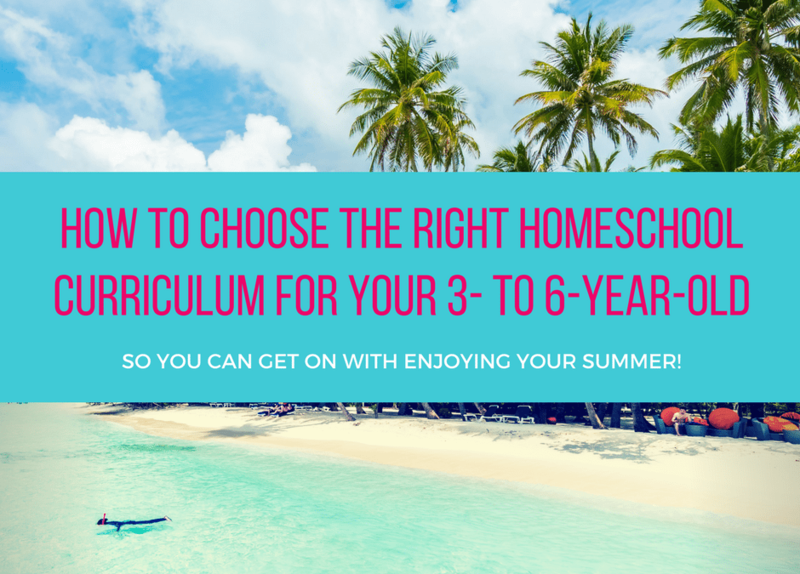 Whether you plan to homeschool longer term, or are homeschooling preschool, pre-kindergarten, kindergarten, pre-nursery, nursery or reception to get your child ready for school, this is an exciting but often difficult time, fraught with dilemmas. HOW do you decide if you need a curriculum or not? HOW do you make an informed curriculum choice – one that will give you peace of mind? WHAT should you look for, to be sure that it will give YOUR child what they need at each stage of their development? HOW can you tell if one curriculum or program will work better for you than another? HOW can you be sure you won’t waste your hard-earned cash? WHAT will you do if your child doesn’t take to it? HOW can you be sure that what you choose to do with your child now, at this age, will give them the best foundation possible for their future educational journey? We can help you make the right choices now, so you can go ahead and enjoy your summer to the full! Following our combined 50+ years of early childhood development and homeschooling experience, and our work with 12 leading educational and developmental psychologists and their revolutionary findings about brain development, learning and giftedness (researched and tested over 46 years), here’s our TOP advice – to help YOU through the maze and to give YOUR CHILD the education of your dreams. Firstly, we do recommend that you do some specific things – that you focus on the development of certain abilities that are proven to help your child excel later at school and beyond, if fully developed before the age of 6 and nurtured thereafter. More on this later in the article. If you are looking for a curriculum to guide you, here’s a list of what you should look for. Even if you decide in the end not to use a curriculum, the second half of this article will help you greatly on what to include in your day, to give your child the absolute best you can. We’ll deal with the practicalities first, as these are more about what helps you as the parent. Later we’ll cover the content as that is what will ultimately determine your child’s success. 1. Offers a no-questions-asked, rock-solid guarantee up to a point where you have been able to test it out properly, or in the minimum a free trial of a reasonable length – so you can have the peace of mind that if it doesn’t work for your unique child, you haven’t wasted any money that could leave you seriously disappointed and possibly prevent you from having the means to buy a different program later. We can’t stress this enough – there are SO many people who have been burned from buying curricula (often expensive) that just didn’t work for them and their children. 2. Is suitably paced, flexible and ultimately ‘affordable’ – if you have to buy a huge package or significant chunk of a program upfront, you will have wasted money if at some point it doesn’t fit yours or your child’s needs anymore. Smaller chunks of a program or a monthly subscription that you can start and stop as necessary will give you the peace of mind that you will never pay for material that you can’t take advantage of. This will buffer you against life’s unpredictability too – you just know that things won’t always go to plan, and to avoid disappointment and frustration, you shouldn’t expect them to. A curriculum with a subscription that you can pause will also enable you to buy it now to give you the chance to evaluate its content properly and then pause it until you need to start it with your child. 3. Provides every resource you need (or clear lists of things you can put together easily from your home, for example) but that doesn’t require the purchase of specific games or materials that will only get used once or at most a couple of times, and leave you with a big hole in your pocket. 4. Provides the content in a simple and easy to follow format, so that your preparation time is kept to an absolute minimum and often allows you to just ‘pick up and go’, freeing up your precious evening time to spend sipping wine, binging on Netflix, or just talking about the kids. 5. Provides you with full and detailed notes for every activity, showing the aims, resources, procedure and learning outcomes, plus supporting photos/images where necessary, so that you know exactly what to do, how to do it, what to use, what to expect and why you’re doing it – more peace of mind and ease for YOU. 6. Looks like it can work for YOU whether you’ve taught before, never before, or somewhere in between, so that you feel confident and guided in your use of it with your child at all times. 7. Is easy to adapt to your own needs or your child’s, and that gives you ideas of how to extend, enrich and continue the learning experience for your child from each activity. This is essential as you will surely want to allow your child to follow their interests and further interests that are stimulated by the activities you do with them. And now for the content – ultimately the most important deciding factor of course, so you can be sure you are giving your child the foundation for excelling in all areas of life. 1. Has a rigorous scientific basis, was written by experienced child development experts, and that offers PROVEN results – if you don’t want an ‘average child’ then why would you use an ‘average’ curriculum? Very few curricula have proven and extra-ordinary results. You can check for the listing of any curriculum you are considering in the 2018 International Handbook for Early Childhood Education – this is a huge volume that catalogues all world-class approaches in detail. Do a Google search for “International Handbook of Early Childhood Education” and “name of the curriculum”. 2. Offers an innovative approach and ‘content’ beyond what a regular academic institution would provide for your child – because if not, why are you homeschooling them? We know that some of you have other reasons, but we also know that you want the best for your child. In spite of newer research, the desperate need for change and the wide availability of innovative programs for schools, it can still be difficult for them and other academic institutions to embrace change for a large number of reasons – but you won’t have any such constraints. So find the best out there and go for it. 3. Is play/game/story-based – no child of this age should be sat down to learn formally. If your child loves worksheets, for example, then give them a few by all means. But unless you want them to burn out, and/or become bored and uninspired students later on, don’t use worksheets as the main basis for your teaching and learning strategy with them. Use a program that helps you get into your child’s world, at their level, where you play, act out and generally have a blast learning through playing together. Children cannot possibly learn everything they need to from the autonomous model above, just as they can’t develop all the skills they need for future successful learning without that model. 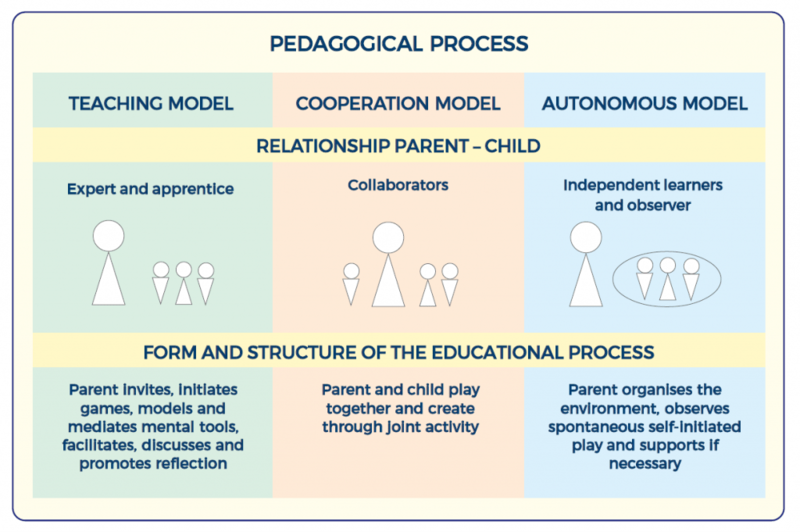 As a result of using all 3 models above through shared play, you will also build a phenomenal connection and learning relationship with your child that will result in them always accepting you as their guide/learning partner. This is critical now if you plan to homeschool them in the later years. 5. Allows your child to live through their childhood as fully as possible but works with them to help them deepen and enrich their child’s eye view. Here we have the essence of what is called a ‘developmental education’. Instead of a curriculum with a sole or mainly academic focus, for your child’s true success you need to choose a curriculum made up of developmentally-appropriate activities that are precisely matched to their learning needs at each stage. 6. Takes advantage of, and promotes, your child’s natural curiosity about the world around them and their high motivation for learning at this age, so that they develop a deep love of learning and become genuine life-long learners. 7. Is off-screen – whether you are a fan of technology use for children or not, the principle time you spend ‘educating’ your child in these crucial years should be hands-on with an abundance of interaction and quality discussion. Screen-based programs can teach your children many skills and do of course have their place in the modern world, but using them as your main teaching vehicle will be to the detriment of the development of other, more critical abilities. So leave any tech-based activities for outside of your main ‘learning time’, along with the worksheets. 8. Provides you with MUCH more than teaching colours, letters and counting. You don’t need to spend money on a curriculum to teach your child colours or counting – if you lack the conversational skills or imagination to do that naturally with your child, then Pinterest is full of easy-to-replicate ideas. In spite of common practice, learning the sounds that letters make, the names of the letters, how to write them and how to read are NOT the first steps nor are they a marker of success for your child. Of course, if your child initiates that, then you should follow their lead. But make sure you also work with them on ‘learning how to learn’ too. Before teaching reading, writing and counting, and other ‘concrete’ skills and knowledge, you need to do activities and have conversations with your child that develop their ‘learning abilities’. These include, but are not limited to: deliberate memory, symbolic thought, imagination, creativity, perception, processing, reasoning, logic, problem-solving; communication, language, confidence, win-win mindset, growth mindset, collaboration; attention, resilience, perseverance, resourcefulness, self-awareness, self-discipline, concentration and planning. If your child masters these abilities before the age of 6, you will never have to worry again about how to help them to be successful. No parent likes to find out later on that their child has trouble processing information, concentrating, understanding concepts, communicating their ideas, or that they give up easily, for example. Ensuring that your homeschool environment systematically develops these learning abilities for each of your children is the best defence and preparation against that. So there you have our best advice – 15 criteria for making the right choice for YOU and YOUR CHILD! One curriculum for home use that meets ALL of the above criteria, and is LOVED by both children and parents world-over, is the ‘Key to Learning Developmental Cognitive Curriculum’. You can click here to learn more and get a free sample pack, to see for yourself why parents are blown away by it and why their children beg for more. The extraordinary, unique and proven Key to Learning @Home program – creating super intelligent, highly motivated, happy children with exceptional mental abilities, through a stunning collection of play-, game- and story-based activities, in just 20 minutes a day in your own home.